To say Joe Belchoir likes pigeons would be an understatement. 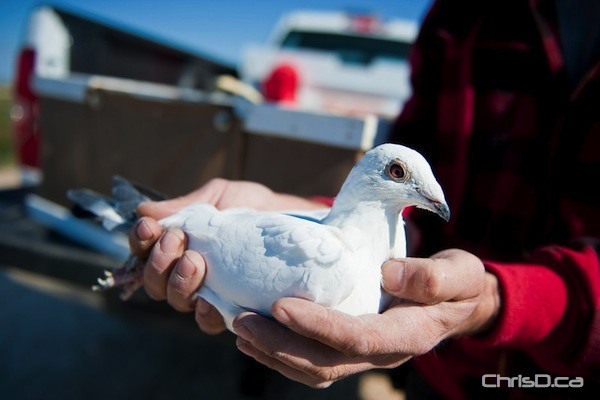 Belchoir currently has 80 homing pigeons in his care and has owned a variety of the birds for 30 years. Originally inspired by his grandfather’s passion of raising them, Belchoir took the pigeons under his wing as a hobby and finds it relaxing. On Saturday, he released a number of the birds on Highway 15 west of Dugald (left). He sometimes even takes them as far away as Thunder Bay to be released into different environments. “Most people don’t appreciate the tremendous service homing pigeons provided during the wars,” Belchoir said. Countless thousands of troops were saved by pigeons delivering messages and intelligence from the front lines.